It has been nearly two years since we last saw Justin Roberts in concert. It has been months since the Portland stop on the Jungle Gym tour was announced. 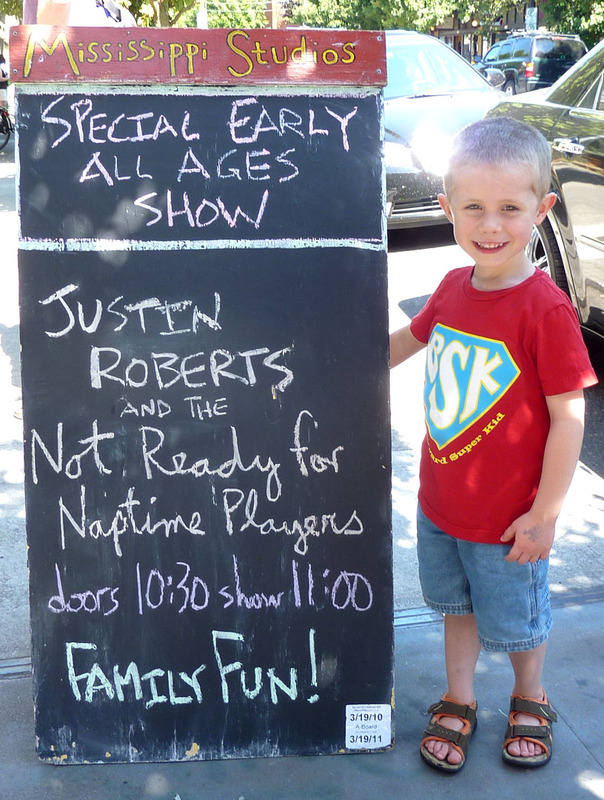 We finally saw Justin Roberts and the Not Ready For Naptime Trio yesterday at Mississippi Studios. Even after so many months of anticipation we barely made it to the concert on time. We somehow arrived early at a concert in WA while living in OR and multiple concerts in IL while living in WI, but getting across town seemed nearly insurmountable. We luckily got three seats together and, since the chairs were not attached to the floor, we jockeyed around a bit and got a good view for each of us. The show included many great songs from most of the CDs. It was the smallest venue where we have seen a Justin Roberts show, but it looked nearly sold out. The crowd was lively and the band was engaging. As much as we enjoy Justin Roberts CDs at home, the concerts really bring the music to life. The songs are well written, they are well performed and the band is very funny. The interstitial humor amuses both kids and adults. Since Liam was on the electric bass (because Jackie was not at this show) instead of his usual electric guitar, this line did not fit as Liam would not have been able to appropriately rock out. Instead, something about 80s soft rock was substituted into the lyrics and Gerald, in honor of another legendary drummer, went off on a Phil Collins solo. I wish I had gotten it on video. It was so funny. The crowd erupted into roars of laughter. We have made videos at every concert and Henrik watches them over and over and over. Since Henrik does not watch TV, the extent of his screen time has (until very recently) been limited to Justin Roberts videos, Rick Steves travel videos and, of course, videos of himself. I just learned a new trick and uploaded a couple videos online. Here is a quick clip of the song Doctor, Doctor from Way Out from Henrik’s first Justin Roberts concert in Chicago. It was almost exactly 3 years ago. Justin Roberts Doctor, Doctor in ORD from Breathe Beauty on Vimeo. Here is Obsessed by Trucks from yesterday’s concert. Justin Roberts–Obsessed By Trucks in PDX from Breathe Beauty on Vimeo. From Great Big Sun to Jungle Gym , every CD is excellent and I would recommend them all. Thank you, Justin, Gerald & Liam for such an enjoyable show. Please come back soon and bring Dave and Jackie with you next time. This entry was posted in Enjoy, Family, Food, Music. Bookmark the permalink. You’re in luck! I posted a video of that “Stay at Home Dad” performance on Sunday. Here’s the Youtube link. Thanks for such a great show review! Thanks for the sharing link! Now we will get to enjoy the 80s soft rock again! Thanks also for reading. I am glad you enjoyed the post. This entry was posted in Enjoy, Family, Food, Music, Uncategorized. Bookmark the permalink.